I woke early to a gloomy and rainy world. Thankful that I’d all but completed the packing the night before, it didn’t take me long to get the last few bits together and be on my way, walking to the station in a light drizzle that I hoped wasn’t going to be a motif for the whole trip. I’d booked a first class seat for the outward journey, considering it only cost about £7 more, it seemed the thing to do. But apparently being able to read is not one of the criteria required to qualify to travel in first class, as in an almost empty and unreserved carriage, I found someone in my seat. What he must have thought when I ignored the empty carriage and sat down opposite him purely to freak him out, I don’t know. The gloom disappeared and I was welcomed to Wales with blue skies. Now this I did hope would be the motif for the trip. With only 10 minutes to make my connection at Cardiff Central and my first train running 9 minutes late, it wasn’t looking good, but I got a wriggle on and somehow actually made it onto my connecting train that would take me to Merthyr Tydfil. 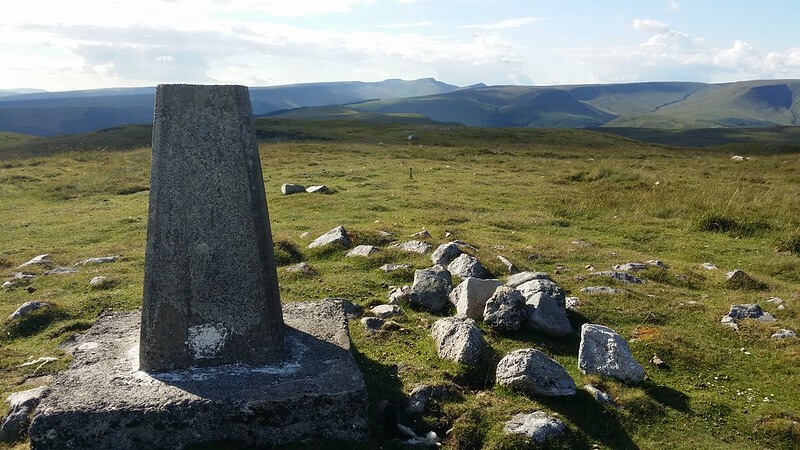 Now Merthyr isn’t actually on the Cambrian Way, but I’d decided to start the walk from there as it gave me the opportunity to take the alternative route up onto the Brecon Beacons and hence pick off a couple of extra peaks that I couldn’t have got the way I went last time. There was also the vague thought of laying to rest the ghost of last year’s walk. 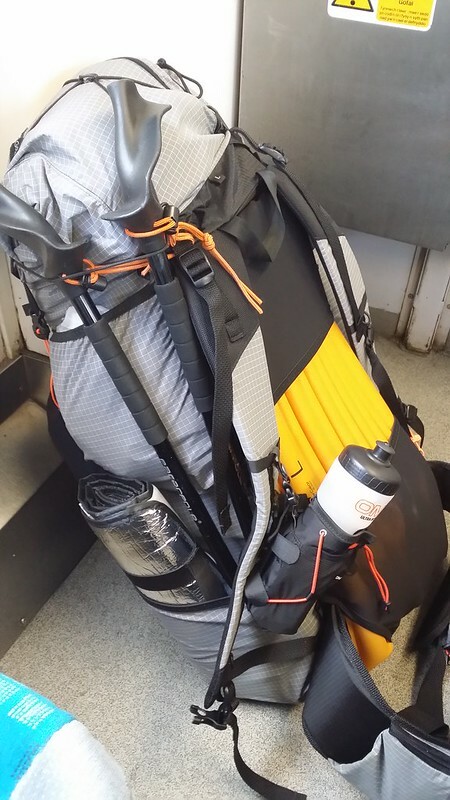 But I felt different this year – fitter due to the efforts made to be ready for the 10-in-10 three weeks ago, and a lot less heavily laden, having effectively swapped the 2.3kg 80L Lowe Alpine Pack I used last year for a sub-1kg Mariposa, and submitted to the packing discipline that a smaller pack enforces. The train picked its way up the valley, shadowing the first day of the overall walk – from the window I easily spotted the weir on the Taff I remembered from last year, and shortly after we passed below a wood with a fairytale turretted castle poking out – Castell Coch. I stepped off the train in Merthyr and noticed a difference with London immediately: people were friendly and would talk to you. They also didn’t look at you as if they’d stepped in something nasty next to a lamppost. First stop was a pop into Tescos for water and eggs, that I hadn’t wanted to carry all the way from home. 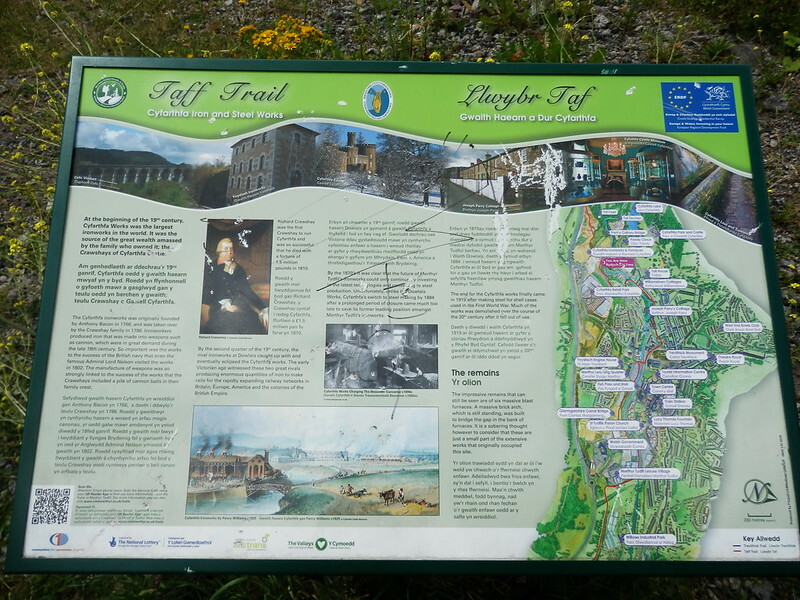 Although it looked relatively straightforward on the map to navigate out of Merthyr, it took a few goes before I worked out the right streets to take to get me out to the trail, and then the signposting was of a kind that I was several times only realising the right way to go when I’d just passed a sign. A few wrong turns quickly realised before I was following the trail more confidentally – i.e when it left roads. Even though the Taff Trail left the road a mile or so out of Merthyr, the surface remained tarmac and the verges were of scruffy wild grass and trees. There wasn’t a great deal to see, and this encouraged me to get my head down and gain some distance. Usually I like days like this – a chance to zone out and just make some decent ground, but I prefer them to not be on the first day, as they make a nice change a few days into a walk. The track threw me onto the road again just outside Pontsticill, and in search of refreshment I climbed up the hill to the village and stopped at the Red Cow for a lime and lemonade and a chat to some other customers. And it was at this point that I made my first mistake – not having a second as I felt I couldn’t drink another whole one. I climbed back out of the valley following the bridleway to Talybont. Clearly not heavily used due to the expressions on the faces of the sheep and due to the lack of trampling of the more overgrown sections. 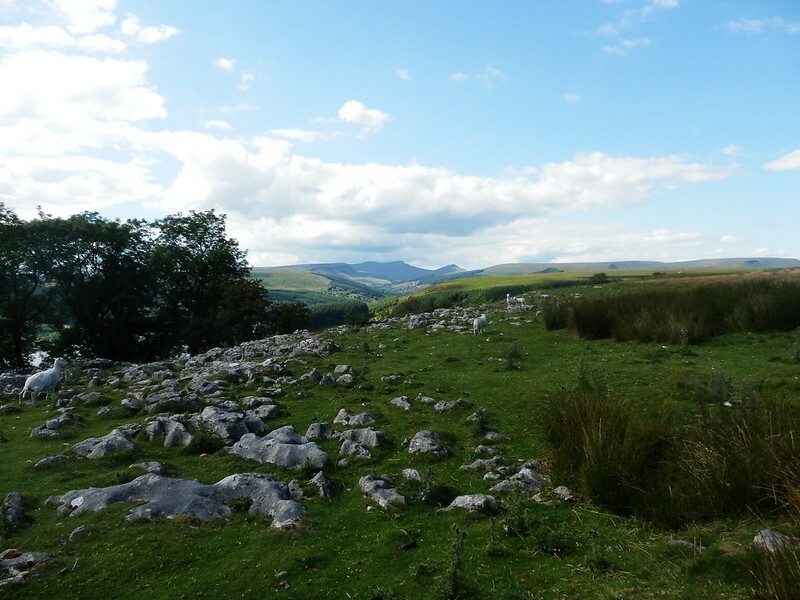 I emerged from the fight through undergrowth onto the open hillside and the first views of the Brecon Beacons. Now came a decision – where to leave the path for the diversion I had planned to bag Cefn yr Ystrad, a Nuttall straggler I could possibly have picked off last time, and kicked myself for not having done. I didn’t like the look of my original plan to simply follow the path until about the 550m contour and then strike up the hill – it looked pretty steep – so I started taking a slanting course uphill from earlier on. A series of sheep tracks and a bit of guesswork finally got me to the large cairn and a short distance further on, the trig point. 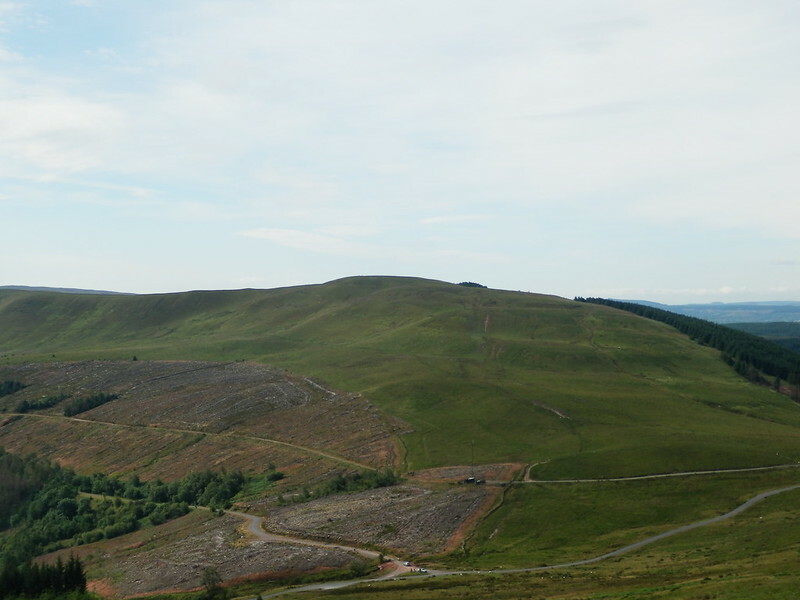 From there, I had great views over to Pen y Fan and friends. With time marching on and drink supplies running low, I was now wishing I’d taken a second drink at the pub and brought the rest of it with me. The rest of the walk to my eventual camp spot became an ever more desperate quest for water, on this dry day. First up though was the descent back to the Talybont path, and I aimed to hit the quarry tracks, finding the quarry easily but failing with the route down through the quarry itself. 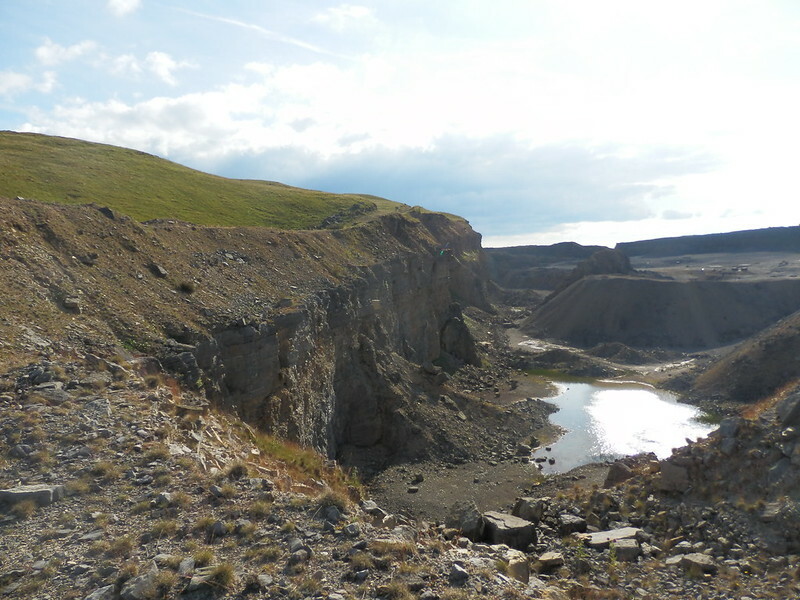 A bit of toing and froing above the rim of the giant hole, before I contoured around the rim to a track that took me down into the quarry and out the other side to meet the bridleway. 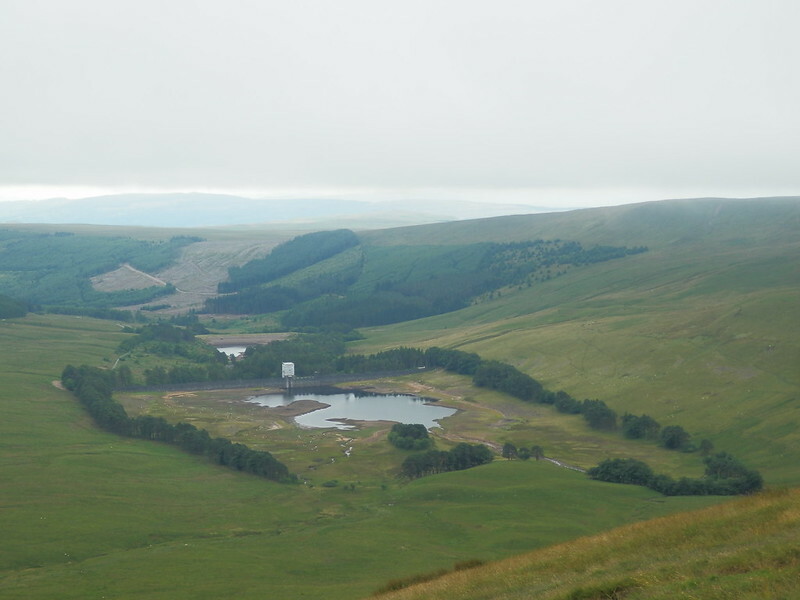 Eyes and ears were now turned up to maximum in the hunt for a source of water, none of the little streams marked on the map on the flank of Bryniau Gleision amounting to anything at all. 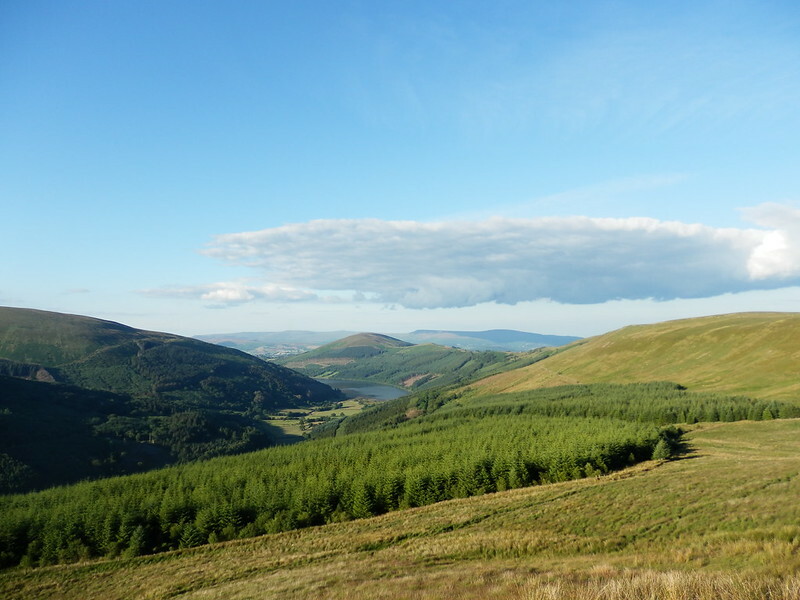 I scared the horses off the summit and set my sights on Pant y Creigiau, after a few moments of indecision where I even considered heading down towards Talybont to find water. The next part was to find one of the many streams flowing down the flanks of Pant y Creigiau that actually had something. All linear depressions heading downhill were investigated until the ground steepened and I had to decide which side of the hill to focus on. I went with the northern, being steeper and a little more likely to have streams actually existing. Several times I thought I heard the trickle of water before I actually did. I discarded my pack and followed a muddy trickle downhill looking for some decent flow away from the path. I found a decently clean source but it was a thin stream of drips that after about half an hour, I lost patience with having garnered only about a litre. Just up from it was a less clear-looking pool and I scooped up a dirty platy full of mud particles and small insects gently enveloped in a clear broth of water. I recovered my pack and climbed back up the, now steep, side of the hill to regain the ridge and look for somewhere to camp, finding somewhere just off to the left of the main path. 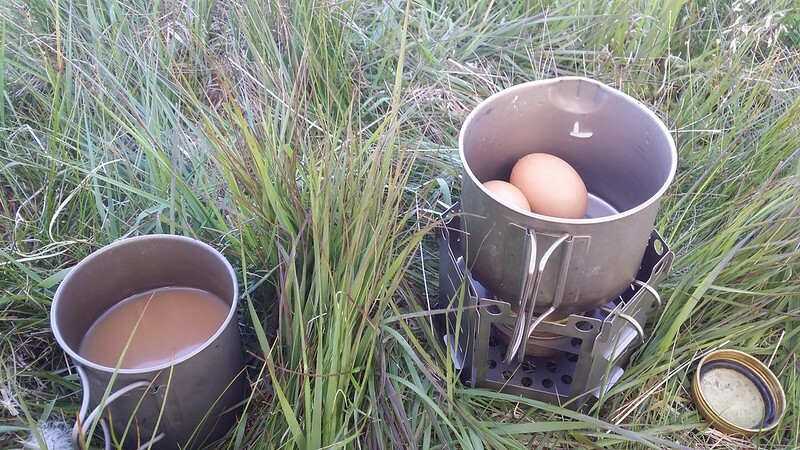 I settled into camp and got my Look What We Found Thai Green Chicken Curry down me – surprised by how spicy it was. 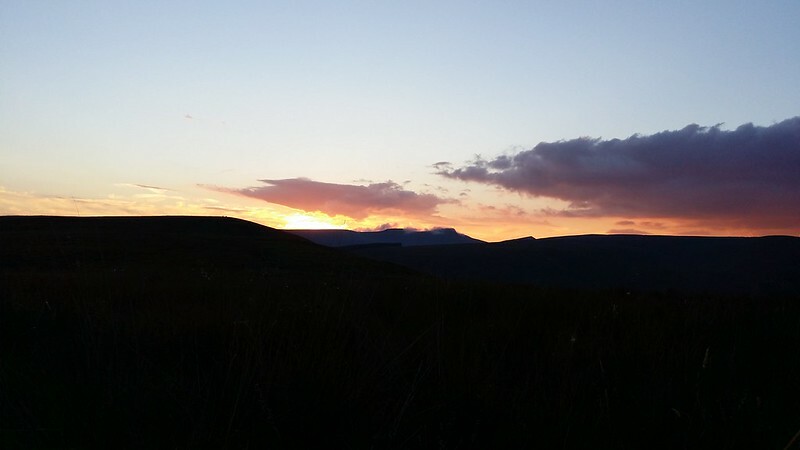 A cup of tea and then watching the sun go down over Pen y Fan. I lit my lantern and wrote up my notes from the day. 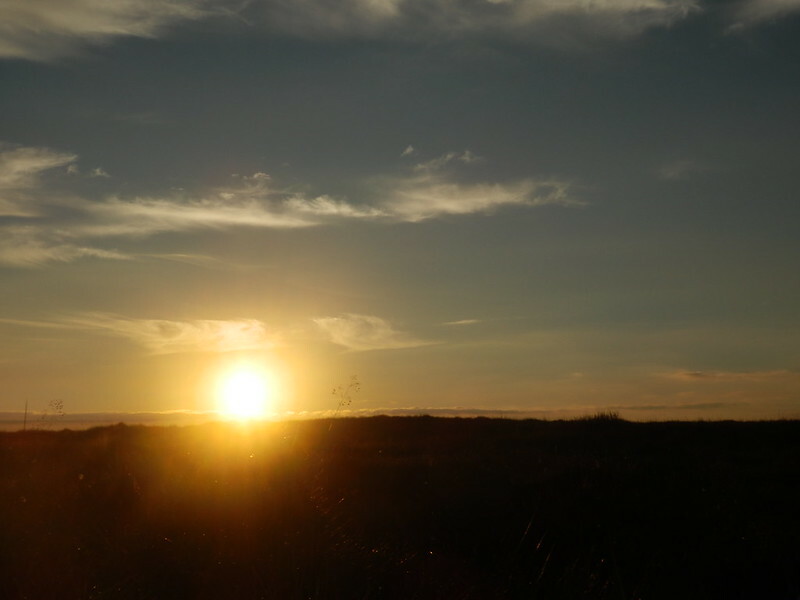 Suddenly I saw a bouncing light appearing to be coming towards me, but after some study not getting any closer. I extinguished my light so as not to tempt them to investigate mine. As it turned out this was the other side of the Pontsticill reservoir, that’s how disorientating and distance-mangling light at night can be. I settled down for the night. 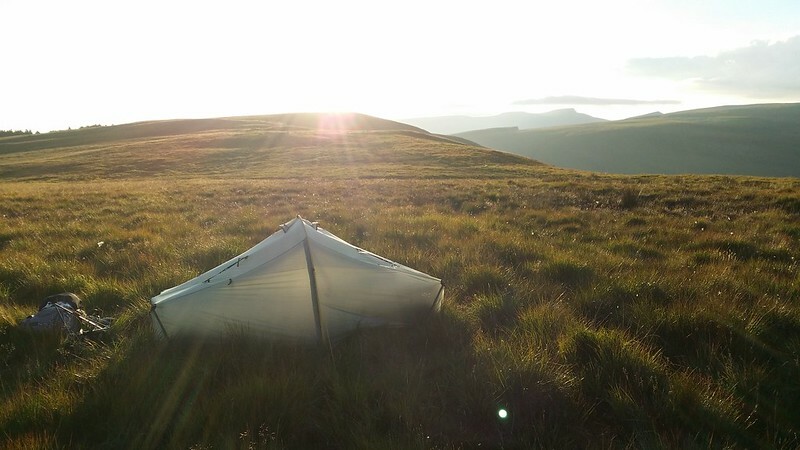 I’d deliberately positioned my tent so that one door opened so as to show sunset and the other to show sunrise – this is one of the benefits of the dual entry that they don’t explicitly tell you on the Tarptent website, preferring to focus on how these doors enable two to use the tent, or for wet gear to be stored separately from the cooking area. 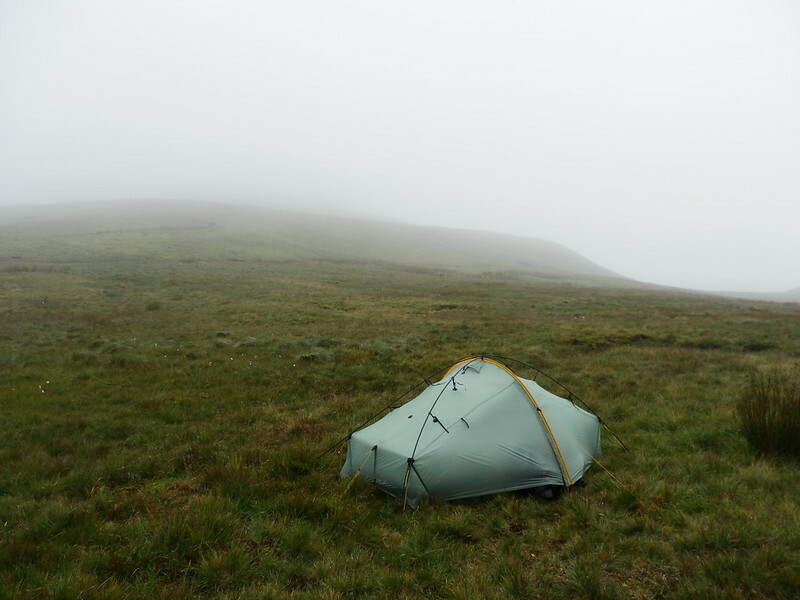 A fairly leisurely start today, as I was just enjoying being out and wild camping. My usual breakfast porridge mix was supplemented with a couple of boiled eggs, 5 of the 6 having survived thus far. 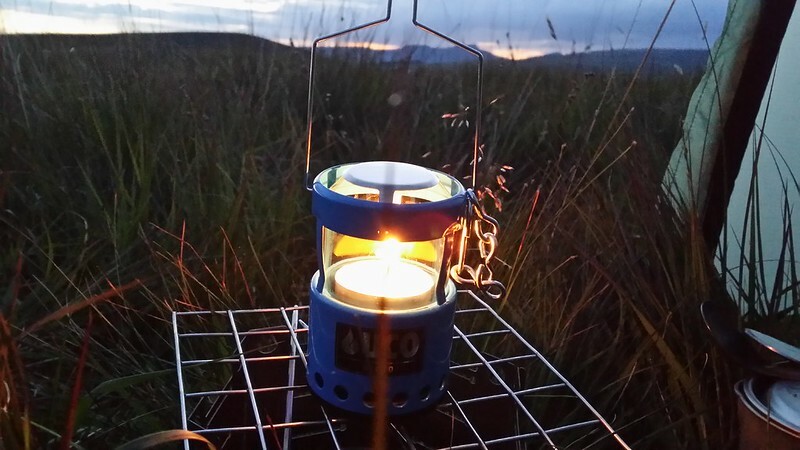 The demise of the sixth actually happened overnight somehow – it made it to camp with no problems. Just before 8am I heard voices coming towards me which turned out to be a group of 5 girls (possibly DofE, except they seemed a lot more sure of what they were doing and to have smaller packs than the norm!! ), which spurred me into action to pack up and be on my way. It was an easy walk up to the summit of Pant y Creigiau and this gave me a good view of today’s walk. I carried on down to the road I could see below, carefully rationing the remainder of my water as I planned to fill up just past the road. 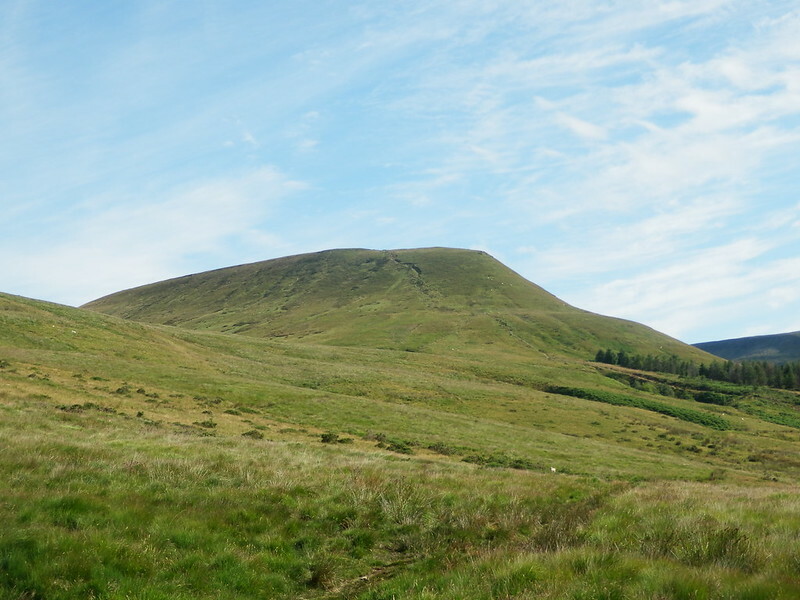 I took a slanting path from the road to the point the climb up onto Craig y Fan Ddu started in earnest, which both saved some descent and reascent if I’d stuck to the road, and brought me close to the waterfalls of Nant Bwrefwr. I refilled with enough for the day, knowing that I’d be able to get some near Storey Arms worst case. I started the trudge up onto the hill gradually catching the next two figures ahead of me due to them unbelievably stopping more than me. The path levelled out and I opted to climb up to the cairn at this end of the ridge and then follow the crest of the ridge for a while, paralleling the path to my right. In so doing I made good ground on the people in front, meeting them as I rejoined the path. We all took a short rest at the point the path splits. Turns out it was a man and his daughter (I presume) training for the girl’s big munro walk coming up soon. They went right for Bwlch y Ddwyallt while I went left for Craig Cwarelli. After a few hundred metres the path turned again and I took the opportunity of a big pile of rocks to sit down and see if I could get a phone signal, with mixed results _ I could get a signal but it wasn’t strong enough to get any useful updates. As I sat there the man and girl came past, having clearly changed their mind. We were to keep leapfrogging each other for the rest of the day. 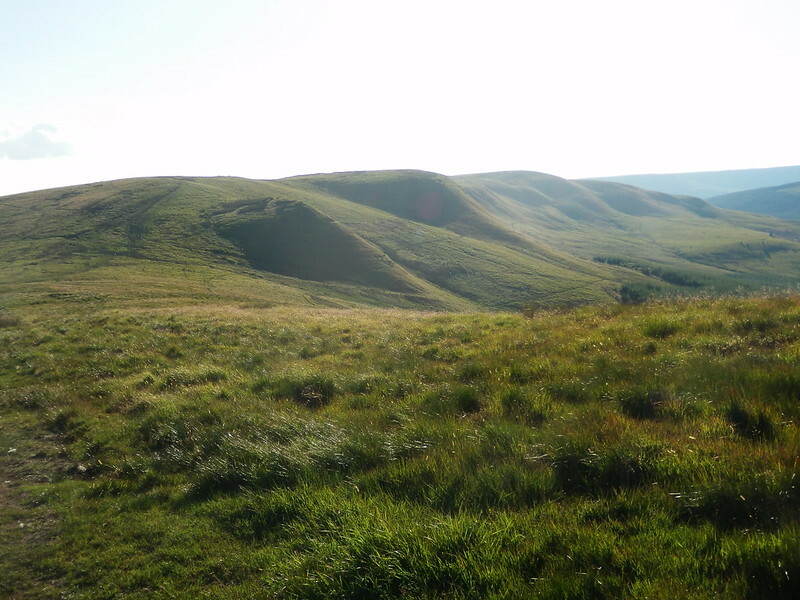 I approached the summit of Craig Cwarelli and joined the main path that runs over the tops to walk around onto Fan y Big. As is customary every time I’ve been to Fan y Big, it was lunch break time. I sat piling unappetising cereal bars into me while I watched the cloud developing over the top of Pen y Fan. It looked like it was settling in for the day. I got going again and did the slow climb up to Cribyn, which I missed out last year due to tiredness and lack of inclination. Not much to see at the top, so I didn’t linger, continuing down to the bwlch and beginning the even bigger climb up onto Pen y Fan. As I got higher, I felt misty rain and by the time I got to the top and endured the usual circus at the summit was struggling to see much out of my glasses. So they were taken off and stuck in a pocket while I walked carefully over to Corn Du. 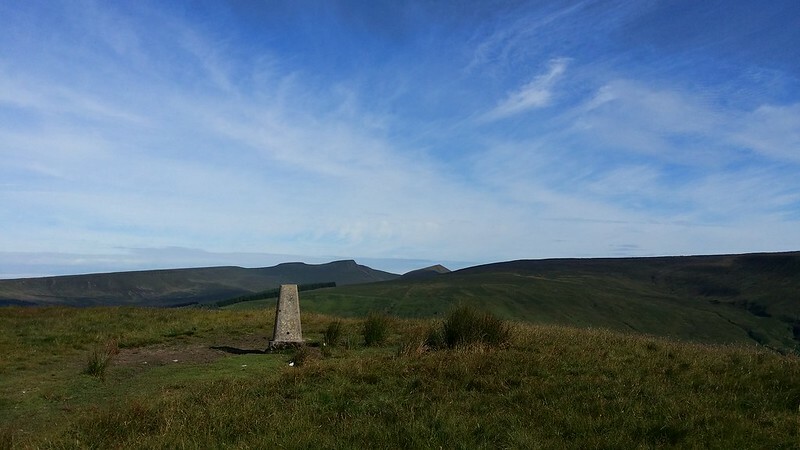 Corn Du wasn’t any better and the mist was making it difficult to see the correct path to take off the summit – I wanted the one that would take me down to Bwlch Duwynt. I followed the main-looking path down a steep scrambly jumble of boulders that without glasses on looked a lot worse than it actually was. I made it to the bottom and found myself at a path junction. By now I was convinced I was heading down Craig Cwm Llwch so took the left path to contour back to where I wanted to be. The first sign of trouble was when that contouring seemed to last for ages but I thought little of it as I joined the main path and started heading down. 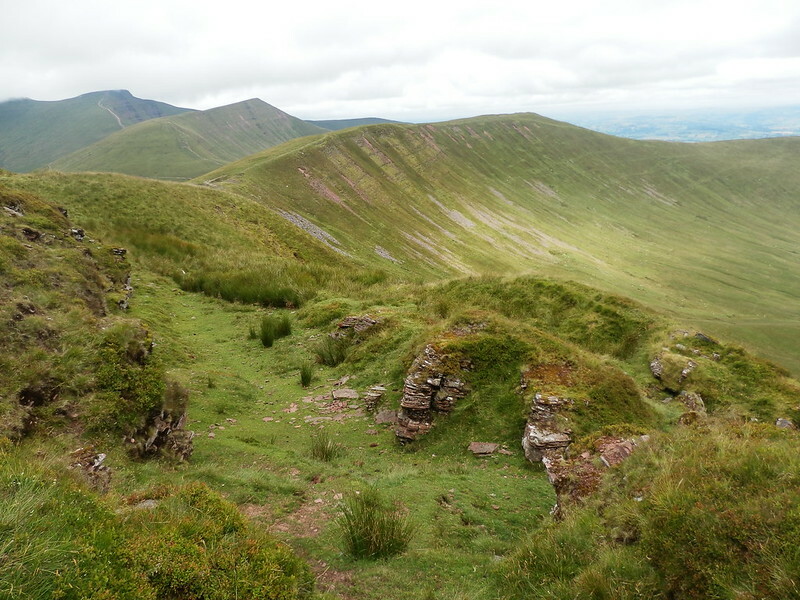 It was only when I got to a place I recognised from earlier in the day – the stepping stones over the boggy bit of path at the bwlch between Pen y Fan and Cribyn that I realised what I’d done. I retraced my steps all the way to the original path junction, which was exactly where I’d wanted to be in the first place. Half a dozen steps down the path I should have taken made it obvious. With energy sapped by the unnecessary detour and an hour of the day lost, I hurried down the path to Pont ar Daf as fast as I could. Given it was after 4pm and quite manky up top I was surprised to see people still heading up. I reached the car park and availed myself of the facilities there – chief amongst these being a cup of tea. The rain started again as I sat there and it started to feel thoroughly miserable. At this point I toyed with the idea of heading a short way back up to find a pitch with guaranteed water somewhere close to the Taf Fawr, but a voice inside me told me I should at least make it to the other side of the road, otherwise I’d have achieved nothing beyond what I did last year. 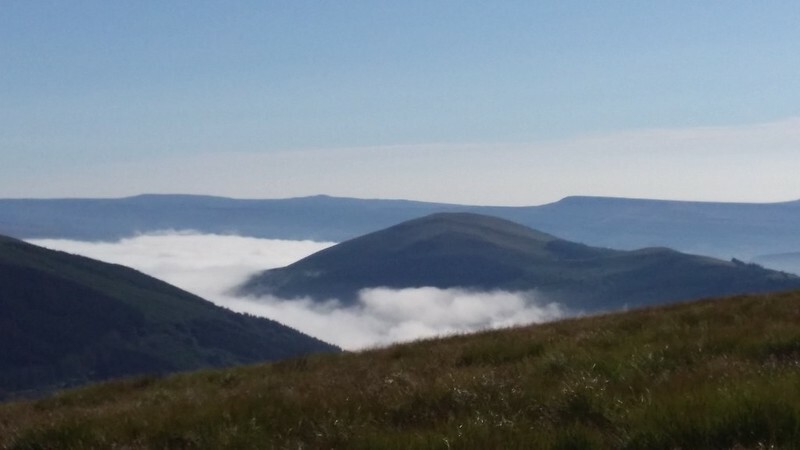 So I walked the half mile up to Storey Arms and then began an ascent of Fan Fawr working my way up onto Bryn Du in the mist and having a big fill up of every container I had at a convenient stream. I’d had enough for today and camp was to be made as soon as I found somewhere suitable. I found somewhere off the main way up but just by a reasonably popular-looking sheep track, saw no one around and pitched. It was a little early at just before 6pm, but it was misty, there was no one around and I wasn’t sure I’d be able to find my way up to the top of Fan Fawr in this. I made dinner, an ok Fuizion minced beef and vegetables that probably would have been better if I’d broken the lumps up more effectively, had a cup of tea and settled in for a night “in”. nearby I could hear voices as late as 9pm so assumed I was close to the main path, albeit far enough away for the purposes of a camp in these conditions. I went to sleep realising I had a lot to do tomorrow.